An MRI scan works by using a powerful magnet, radio waves, and a computer to create detailed images. Your body is made up of millions of hydrogen atoms (the human body is 80% water), which are magnetic. When your body is placed in the magnetic field, these atoms align with the field, much like a compass points to the North Pole. A radio wave "knocks down" the atoms and disrupts their polarity. The sensor detects the time it takes for the atoms to return to their original alignment. In essence, MRI measures the water content (or fluid characteristics) of different tissues, which is processed by the computer to create a black and white image. 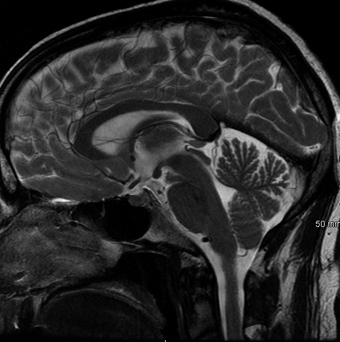 The image is highly detailed and can show even the smallest abnormality. Similar to CT, MRI allows your doctor to see your body in narrow slices, each about one quarter of an inch thick. For example, imagine that you are slicing a loaf of bread and taking a picture of each slice. It can view slices from the bottom (axial), front (coronal), or sides (sagittal), depending on what your doctor needs to see. A dye (contrast agent) may be injected into your bloodstream to enhance certain tissues. The dye contains gadolinium, which has magnetic properties. It circulates through the blood stream and is absorbed in certain tissues, which then stand out on the scan. MR angiogram (MRA). MRI can be used to view arteries and veins. Standard MRI can’t see fluid that is moving, such as blood in an artery, and this creates "flow voids" that appear as black holes on the image. Contrast dye (gadolinium) injected into the bloodstream helps the computer "see" the arteries and veins. Contrast is also used to view tumors and arteriovenous malformations (AVMs). Nearly every part of the body may be studied with MRI. MRI gives very detailed pictures of soft tissues like the brain. Air and hard bone do not give an MRI signal so these areas appear black. Bone marrow, spinal fluid, blood and soft tissues vary in intensity from black to white, depending on the amount of fat and water present in each tissue and the machine settings used for the scan. The radiologist compares the size and distributions of these bright and dark areas to determine whether a tissue is healthy. Head and neck (Fig. 1). MRI can be used to detect brain tumors, traumatic brain injury, developmental anomalies, multiple sclerosis, stroke, dementia, infection, and the causes of headache. Figure 1. MRI of the brain. Arteries and veins (Fig. 2). 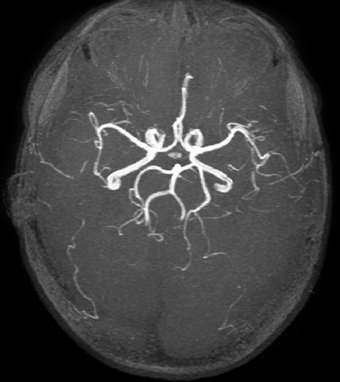 MRA can detect aneurysms, blockages of the blood vessels, carotid artery disease, and arteriovenous malformations. Figure 2. MRA of the brain arteries. Spine (Fig. 3). MRI is sensitive to changes in cartilage and bone structure resulting from injury, disease, or aging. It can detect herniated discs, pinched nerves, spinal tumors, spinal cord compression, and fractures. Figure 3. 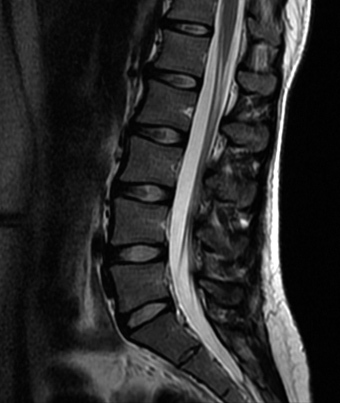 MRI of the lumbar spine. Standard MRI: this machine looks like a long cylinder with a narrow tube in the center. You lay on a moveable bed and your whole body slides inside the tube. Even though this machine can be confining to some people, it produces the best-looking images. 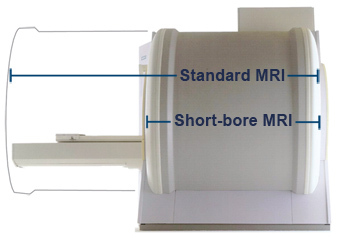 Short-bore MRI: this machine is similar to the standard, but it’s about half the length. If you are having pictures taken of your head, then your feet will stick out one end of the tube; if your back is being imaged, then your head will stick out. You may find this option more tolerable if tight spaces make you anxious (Fig. 4). Figure 4. Viewed from the side, a short bore MRI is half the length of a standard MRI, which means your whole body does not have to be inside the scanner, just the area being imaged. Open MRI: this machine is designed more like a bagel sliced in half rather than a donut hole. It is a good choice for large or claustrophobic patients because there is much more room inside the machine. The only disadvantage is that the images it produces are not as detailed as those made by the standard or short-bore MRI scanners (Fig. 5). Figure 5. Viewed from the front, an open MRI resembles a bagel more than a donut, allowing the person being scanned more room. Wear comfortable clothes since you will be lying still for about 30 minutes. You will lie on a moveable bed with your head cradled on a headrest and your arms at your sides. An antenna device, called a coil, will be placed over or around the area of the body to be imaged. It is specialized to produce the clearest picture of the area it is placed over. If the MRI scan will be used for surgical planning, the technologist may place small markers called fiducials on your forehead, face, or behind your ear. Fiducials look like lifesavers and assist the surgeon during image-guided surgery. Do not remove or get the fiducials wet. When you are comfortably positioned, the table will slowly move into the magnetic field. The technologist will stay in constant contact with you. You can listen to music on a stereo system during your testing. As the exam proceeds, you will hear a muffled "thumping" sound for several minutes at a time. This is the sound of the pictures being taken. There will be no pain or discomfort associated with the sound or exam. The exam usually takes 20 to 50 minutes. It is important that you relax and lie as still as possible. Any movement during this time will blur the picture. You may be given an injection of contrast dye (gadolinium) into your arm or through an IV to enhance the images. After the test is complete, the IV will be removed and you are free to go. You may be told to drink lots of fluids to help your kidneys remove the contrast dye from your body. MRI is very safe. There are no known health risks associated with the magnetic field or the radio waves used by the machine. Some people are sensitive to the contrast agent and may develop an allergic reaction. 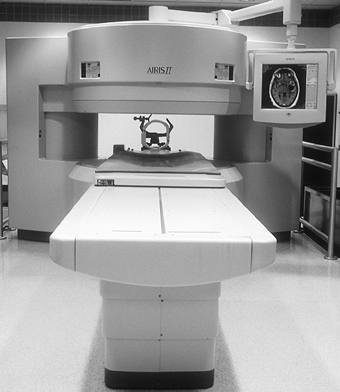 All contrast agents are FDA-approved and safe. Be sure to tell your doctor if you have diabetes or kidney problems. In some cases a kidney function test may be needed prior to the MRI to make sure your kidneys are able to clear the contrast agent from your body. Any metallic substance on your body can affect the quality of the images. It can also cause discomfort or injury to you when placed in the magnetic field, and may exclude you from the exam. Also, be sure to tell your doctor if you’re pregnant. The American College of Radiology recommends that MRI scanning not be done in the first trimester of pregnancy. After the first trimester, there is no definitive research indicating that MRI is contraindicated in pregnancy. However, you will need to obtain a written order from your gynecologist for the test to be performed.